Despite her looming deportation, Sister Pat Fox has filed a petition for the renewal of her missionary visa, which expires next month. Sister Patricia, who is appealing a deportation order issued by the Bureau of Immigration (BI), hopes same government agency will accept her petition. The 71-year-old Australian nun also hopes her plea will be accepted so that she can continue with her mission in the Philippines, which she first began in 1990. Because she has sought the reversal of the deportation order issued last month, the directive not yet ‘final and executory’. The BI ordered the forfeiture of the Fox’s visa due to her alleged involvement in “partisan political activities”. It claimed that she had attended rallies, an activity forbidden under the terms of her visa. But the nun has repeatedly said that being with protesters, who are often members of oppressed groups, was part and parcel of her missionary work. 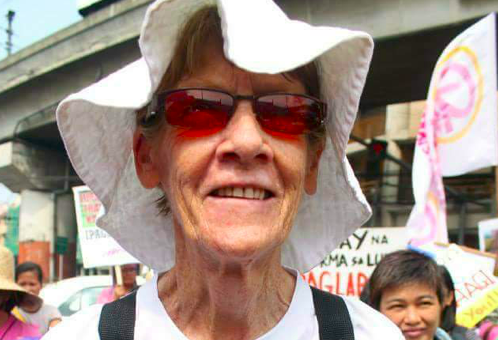 A statement posted on the Hands Off Sister Patricia Fox Facebook page today (Monday, August 20) said: “Sister Pat hopes that the Central Receiving Unit (CRU) of the BI accepts her petition even if there is a pending deportation order against her. The statement said the CRU had a duty to transmit it to the Board of Commissioners for consideration — so whatever its decision might be, Sister Pat would be able to “avail of appropriate legal remedies to protect her rights as a duly-admitted missionary to the country”. The nun’s camp said it would be good if the Board of Commissioners renewed her visa so that she could continue her missionary work among the deprived and the oppressed. “In return the people that she serves also treasure their beloved advocate who continue to give them hope and inspiration,” the statement read. The BI issued the deportation order against Sister Patricia on July 19. The original investigation into her activities in April was personally ordered by President Duterte.